This suspension takes effect Friday, December 15, 2017 at 6:00 p.m. and bans all outdoor burning except for campfires within organized campgrounds or on private property with landowner permission. Campfires may be permitted if the campfire is maintained in such a manner as to prevent its spread to the wildland. A campfire permit can be obtained at local fire stations and online at PreventWildfireCA.org. It is anticipated that the suspension will be lifted on Tuesday December 19th. 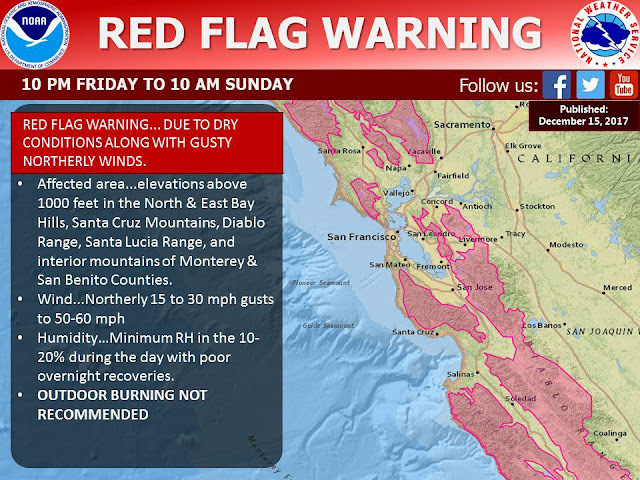 The National Weather Service has issued a Red Flag Warning for the higher elevations of the San Francisco and Monterey Bay Areas. This will involve Gusty North and Northeast winds, Low Humidity and Increased Fire danger. This watch is for the period of 10 pm, Friday to 10 am Sunday. Even after the significant rainfall accumulation the region received during November, the past two weeks has been dry, warm and windy. This weather has created conditions which have effectively negated the moisture received last month. CAL FIRE reminds residents that burning during this ban and under these conditions could result in a citation. In addition, a person burning during these and other conditions can be held both financially and criminally responsible for any fire that escapes their control. Keep in mind, now is the time to start planning your defensible space around your home for next year’s fire season.